The third annual Great Peconic Race on Shelter Island will be held this coming Saturday, Sept. 10, and this year, paddlers will seed Peconic Bay with clams and eelgrass shoots in a joint effort with Cornell Cooperative Extension’s marine science program. This year’s race will include a post-race beach barbecue to raise funds for CCE’s Back to the Bays Initiative. Proceeds from this year’s Great Peconic Race, paired with sponsorship by Corcoran and private contributions received from a Good Circle crowd funding campaign, will help enable an impressive amount of work to be done in support of the health of our bays. CCE and local paddlers have recently seeded 5,000 bay scallops into a new spawner sanctuary in Shelter Island Sound, along with eelgrass test plantings. On the day of the race, 2,500 shoots of eelgrass will be prepared by volunteers on Wades Beach and planted by CCE’s dive team. Ten thousand hard clams will also be seeded by the paddlers off Shelter Island as part of the race. 2. Buy Tickets/Sponsorship to the Post-Great Peconic Race Beach BBQ Catered by Schmidt’s featuring BBQ chicken, ribs, shellfish and more with plenty of local wine and Montauk Brewing Company & Greenport Harbor Brewing Company beer to enjoy. Proceeds directly support habitat and shellfish restoration projects. 3. Can’t make the Race or the BBQ? Then join the paddling community in pledging support of the work of CCE’s Marine Program by donating to the Good Circle Campaign designed to generate funds for the Shelter Island/Sag Harbor Back to the Bays Stewardship Sites. Visit http://goodcircle.org/projects/backto-the-bays/ to give. 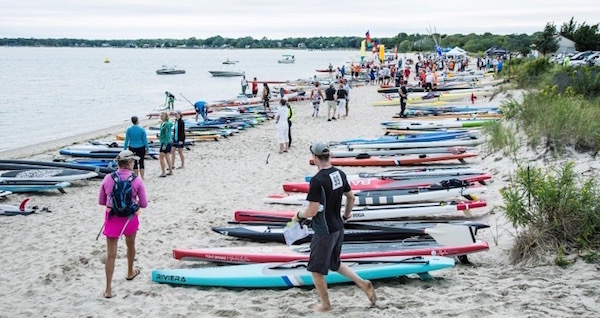 The Great Peconic Race welcomes all types of paddlers, including SUP, Surf Ski, OC1 – OC6, Kayaks, Coastal Rowers, and Prone board. The race includes the premier, 19-mile race course which circumnavigates Shelter Island, and new this year, an approximately 9-mile race course which goes halfway around the island in addition to a 3-mile race course. Recreational paddlers are welcome to compete in all races, although the organizers recommend that advanced paddlers compete in the 19 mile race. While all races are eligible for trophies, only the 19 mile course is eligible for cash prizes. This is an open water paddle race, circumnavigating Shelter Island. Participants can expect open bay conditions, which may include strong currents, and a variety of wind and wave conditions. GPR was created to let paddlers experience the beauty of the Peconic Bays and to challenge your will to withstand whatever Mother Nature throws at you. The race honors North Sea native Ted Baldwin, who lived for the water, but died fighting off disease. There wasn’t a sport or activity on the water that he had not tried while growing up on the bay, including designing a slalom course in Scallop Pond, sailing around Robin’s Island, to jet skiing, and parasailing. The race begins at 9 a.m. on Sept. 10 at Wades Beach on Shelter Island. The race is open to all seaworthy crafts powered by oar or paddle. More information is online at www.greatpeconicrace.com. You can register online at PaddleGuru.com. Registration for the 19-mile race and 9-mile race is $125, registration for the 3-mile race is $90 and tickets to the beach party benefit for Cornell Cooperative Extension are $75.